Hey friends! 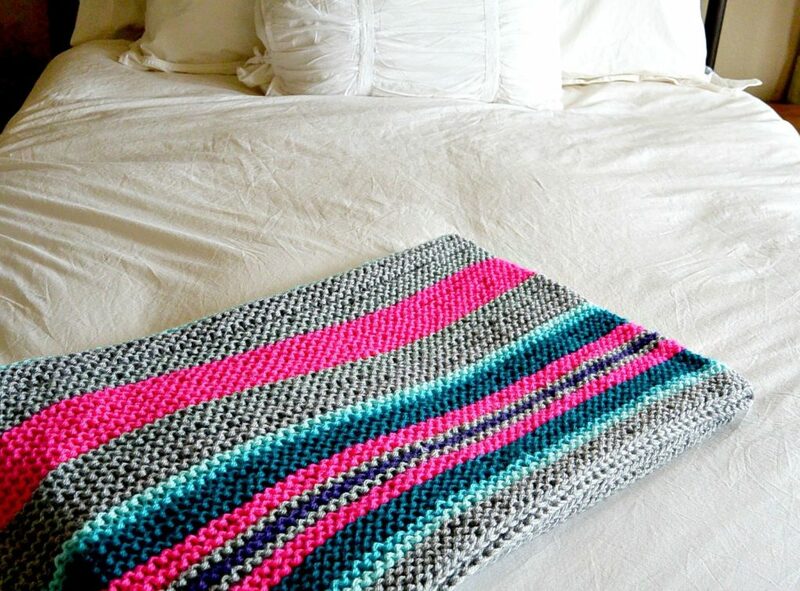 Being that it’s blanket season, I wanted to share this simple cable knit throw that I made a couple of years ago. It was so much fun for me to work the cables and the blanket knit up surprisingly fast. It’s easy as it’s mostly made up of garter stitch, simple stripes of stockinette and two super simple cables. Anyone who wants to venture out into the world of cables from doing basic knit stitches should be able to enjoy this pattern. 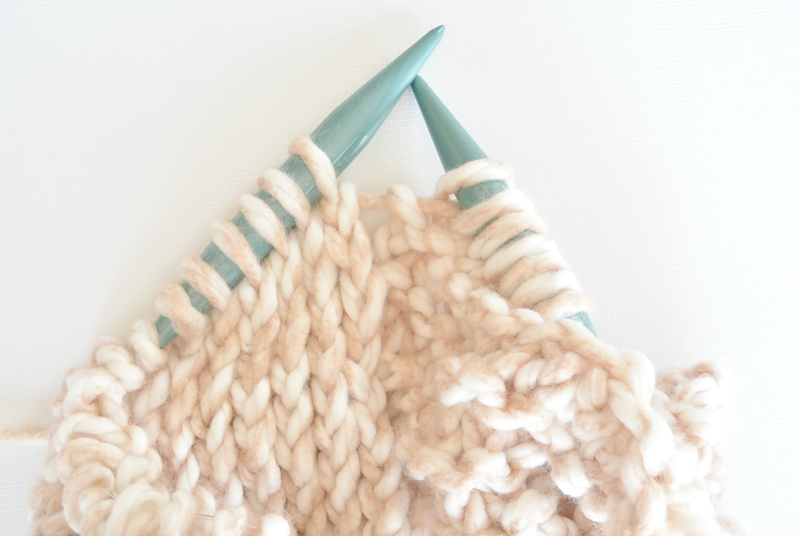 You can also find a step by step photo tutorial on how to knit this exact cable stitch pattern on the blog (here). Below: My baby all cuddled up in cables! When I take the time to knit or crochet something, I hope that it can be appreciated for a long time. 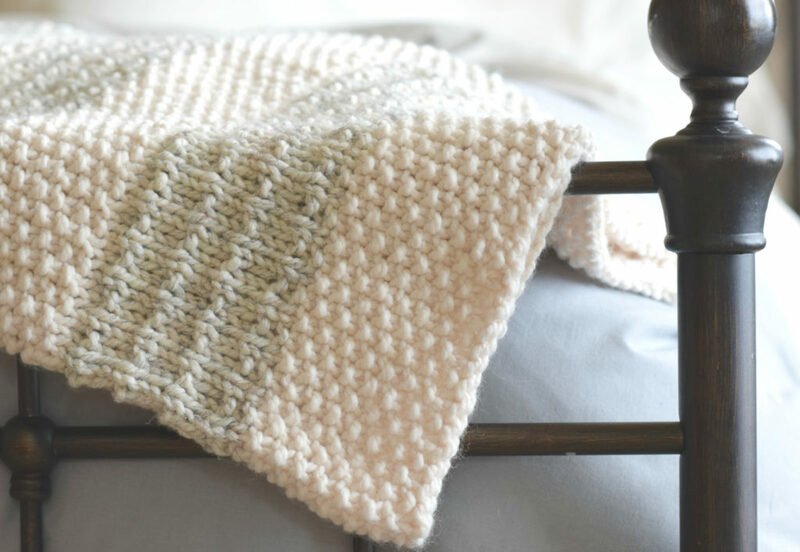 Cables are classic and timeless, so my favorite thing about this cable knit blanket is that it isn’t going out of style anytime soon. It’s also nice because it’s a fairly big project but not overwhelming because of the big needles and big yarn. Yay! It had to be named “Endless Cables” because the blanket is all about the two forever long cables that look like they are going to twist themselves right off the end of the afghan. 🙂 Cables you say……easy?? YES! These are super duper easy cables, and you can see my picture tutorial below on how to make them. The “lapghan” only uses knit and purl stitches, so it is very doable if you’ve got the knit and purl thing down. This “afghan” is more like something I’ve heard referred to as a “lapghan”. It’s smaller than your typical afghan. It would be great for someone who just needs a light and manageable throw blanket. You will see there are a lot of repeat rows and you make the same simple cable row every 9 rows. 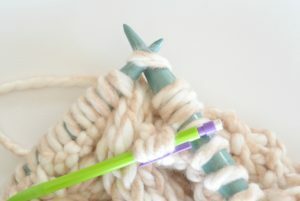 It’s also easy to see mistakes with the big yarn and needles. So let’s get started! Row 11-15 Repeat row 7 and 8. In other words, for row 11 – repeat row 7. For row 12 – repeat row 8. Continue repeating the sequence of row 7 and then row 8. Tie off, weave in all ends. Here you’ve just come to the point in the pattern where it says “LC”. We are going to make our cable now! With your cable needle, or in my case, with a pencil, slide off the first four stitches. See my pencil taking off four stitches? That’s what I’m talking about girl! Now pull that cable needle, or “pencil” with the four stitches down in front of your knitting. Just let it hang out there. Proceed to knit the next four on your knitting needle. Then I place the four stitches BACK on the knitting needle. From here, you will knit those four stitches. Some people knit them right off the cable needle. I prefer to place them back on the needle and knit as normal. Knitting the four stitches that I put back on the needle. Finishing the cable! I hope you enjoy your cuddly, giant “Endless Cables” knit blanket as much as I do! Feel free to share pictures if you make one of these (or share any of your Mama In A Stitch projects with me on my Facebook Page )! You can also tag me on Instagram @mamainastitch. 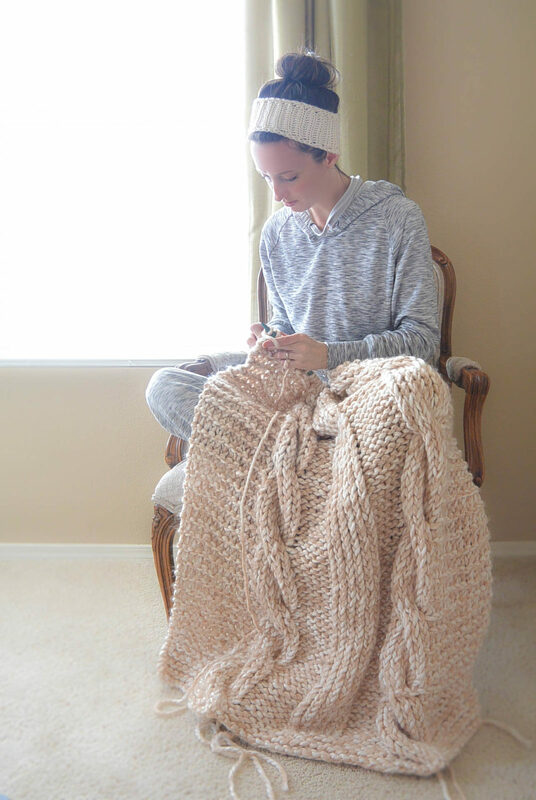 If you crochet you must check out this gorgeous crochet cabled blanket by Stephanie at All About Ami!! We were working on our blankets around the same time and both laughed because they are so similar! Beautiful Jessica!! I love it! I need to learn to knit some day! So tricky! Jessica, I love this!!!! Way to go. I have filed this in my head as a “to do project”, I really just love it. I appreciate your detailed instructions! Oh good! I’m so glad that you like it Esther, and also that you think the instructions are good. I so appreciate you taking the time to let me know friend! Hi Jessica! Im from South Africa and as a child my gran taught me to knit. I havent done in it years though and upon visiting your site I fell in love with the afghan. However we dont get the wool you mentioned and the needle sizes you mentioned. I took on the project nevertheless with 15mm needles. Do tou think it will affect the end product much? Hi Nadene from South Africa! 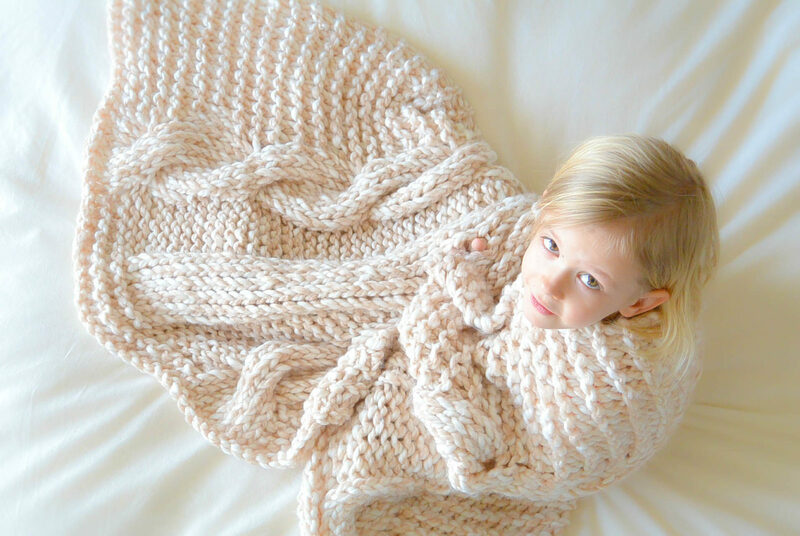 It may make the blanket a bit smaller using a smaller needle and possibly smaller yarn. You might want to plan to add another rib in the middles, so instead of the one rib down the center, make two. This way the blanket might be a bit larger, but won’t be smaller. I think that might be the easiest way to make sure it turns out large enough. If you don’t mind it being smaller, then just follow the pattern. You might be able to tell once you start on it. Good luck! Thanks Kathy! It is very doable. I’m the same way – always thinking that I will start early on gifts. Ha! Thanks for the sweet words about my baby girl. Beautiful blanket and photos! I don’t knit, but I’m thinking about a crochet version. You’re right–super expensive in stores. Thanks for the free patterns. Hi Susan! A crochet version would be just as wonderful. You’re welcome for the patterns. It’s so fun for me to share. Thanks for taking the time to leave me a note! So lovely…how does it wash up? The best way to wash it would be by hand and then gently squeeze as much water as you can from it. After that, the best way I have found is a method my mom taught me around 60 6ears ago and I still use on all my apologies. Take a couple of towels, large enough to accommodate your project, and lay them on top of each other on top of a good thick layer of newspapers. Then carefully lay your project out on top of these layers. Be careful not to create wrinkles.. Roughly block it by hand. Next, repeat layers of towels and newspapers for absorption. Finally, if you have a carpet or large mat, for disguise I think, place that on top. Now you are done except for using every excuse to walk all over area. Every time you are in the area, March over it. I enroll family members for this too! It takes a couple of days, but every time it has pressure applied more water gets squeezed out and is absorbed by the layers. If you did a good job laying it out and blocking it you will end up with a beautiful pressed article that looks very professional. Sounds very fussy, but we’ll worth it in the long run. I always feel proud of the finished article. Give it a try. Gorgeous! I knitting up a chunky blanket at about this time last year in a simple rib pattern using charcoal gray Bernat Mega Bulky and I love it. This pattern makes me believe it may be time for another! 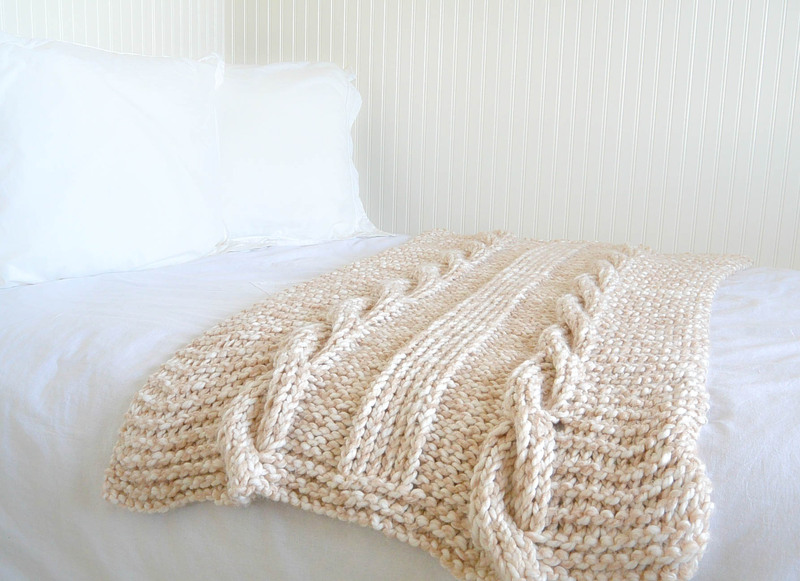 I love, love, love this chunky knit throw!! Your patters are great! I have knitted up several throws and love them. Thinking this might be my next one! Thanks so much for showing your awesome talent to inspire others!! Your use of the mechanical pencil with the clip to hold the stitches is BRILLIANT! I can’t wait to try this pattern! As a newbie to knitting – just a quick question! 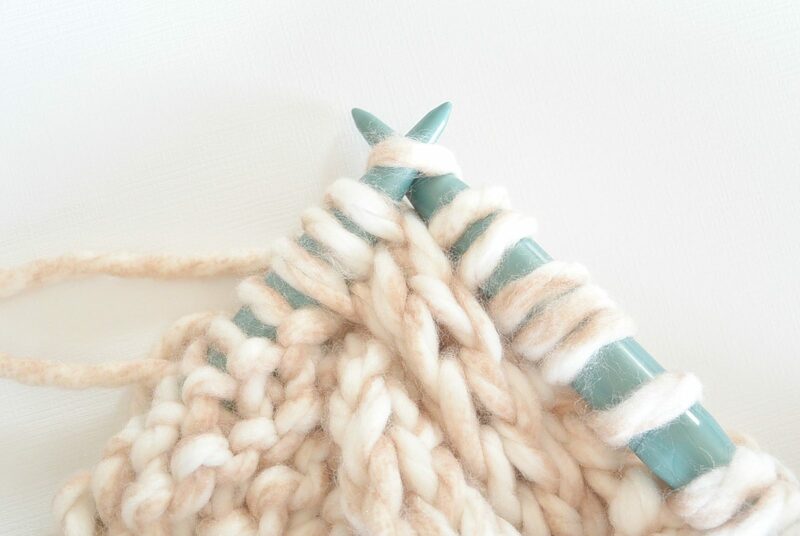 When the directions show: Row 16 K 13, LC, P6, K6, P6, LC, K13, do I knit the 4 LC stitches that I put back on my needle before moving to P6, or do I place the 4 LC stitches back on and immediately purl 6? 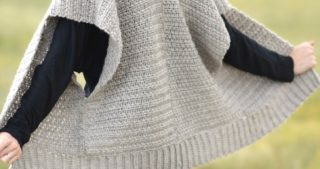 In the same effect – when the directions read: Knit 13, LC, Knit 18, LC, Knit 13, do I knit the 4 LC stitches back on before I count Knit 18, or do those four knits count as part of the Knit 18? 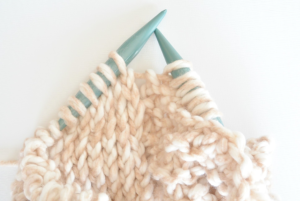 So you immediately knit the 4 stitches that you’ve placed back on your needle. After that, then you will purl. Does that help? It’s the same for your second question, you need to knit the four that you’ve put back on your needle, and then proceed to knit 18 more. I hope this helps, and good luck! I love the throw. With 9 skeins what method did you use to switch to a new skein? So what I do (there may be other even better methods) is I make a knot flush to the blanket where the new yarn meets the old yarn, I then continue the pattern after joining, leaving an extra long tail to weave in. Sometimes I even hold the tail with the working yarn and knit it as well just to make it a little stronger. You just have to be careful to treat that as one stitch when you come back around since it appears to be two stitches. I like to refer to the Purl Soho website as they have a great page on how to best weave in ends. I know many knitters don’t make knots, but I feel better about the blanket not coming apart (especially with a loose knit like this). So far so good with this blanket. I haven’t washed it, but think I will hand wash it if I do. 2: Go down a needle size, use Hometown USA and make the additional ribs or cables as you want. You might have to do some math for that. You could add more knit or garter stitches to each side which would be easy, but I’m not sure if it will result in the look you want. Good luck! 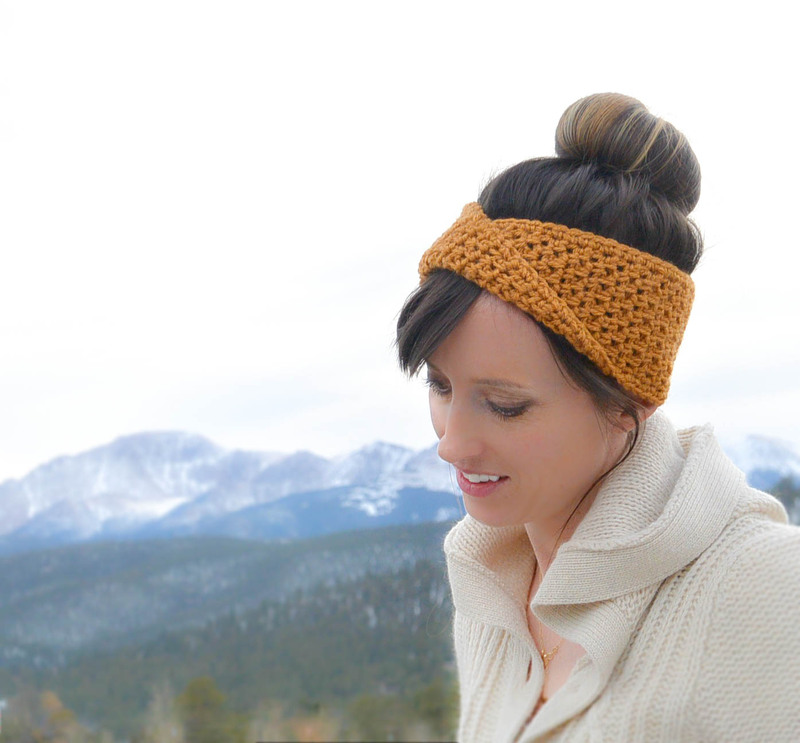 If you want to try an easier way to start cables, you should scroll up to a more recent post where I just made a simple cabled headband with Hometown USA. 😉 Glad you like it and good luck Olivia! Love this pattern and even though I am a beginning knitter I think I could do it. Like Olivia said, availability of Color Cloud or other Weight 7 yarn is limited, and expensive. I am thinking about a Weight 6 yarn and a size 13 (or maybe an 11) circular needle, but would like to increase the width. I think casting on 86 stitches and adding adding another K18 or K6P6K6 plus P8 or LC (depending on row) after the second cable should accomplish this. However I am not sure what to do with Row 8. Any help would be greatly appreciated. Thank you so much and have a blessed day. I think I can kind of see what you are planning, but I may be a little confused. 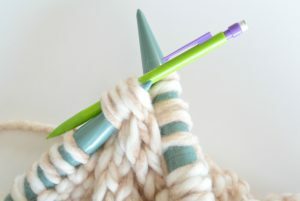 So you are adding the stitches after the second cable and plan to include another cable right (or another large rib like in the center)? I believe you will just knit across that entire section on row 8 if you’re doing a cable, though the way I picture it, you will have two cables on one side of the giant rib down the center and one on the opposite side. I think I’m probably picturing it wrong, but I do believe that knitting across that section if you’re adding a cable. If you’re wanting to do another rib row, you will p6, k6, p6 to make another rib. My only other thought might be that once you get started you will see how row 8 should be knit in order to keep the “right side” looking the way that you want. Hopefully you can get it figured out and good luck! Like Dottie (above) I want to increase the width of this lapghan to about 80-86 stitches. Has anyone any ideas on how to do this I would greatly appreciate the help. Jessica, I love your lapghan. It looks great and has inspired me to knit one. I have ordered Moda Vera ‘Monkey’ yarn in grey from Spotlight. (I’m from Australia). I’ve just learned how to cable (much easier than I thought it would be!) and am eager to try a big project in a chunky yarn that would be work up quickly. Instant gratification lol. So, you can add 26 stitches and get an extra cable (8 stitches) and rib with the side panels (18 stitches ), for a total of 86 stitches. You want to start with the garter stitch edge and then work your cable and rib pieces across. The it would go cable, rib, cable, rib, cable ( with the sides of garter stitch ). Hopefully that will work out! See my reply to Monica in the comments. I sort of wrote out what I think you can do with the 86 stitches. Thanks so much for the kind words about the lapghan. Yes, this is definitely a quick knit (for a blanket anyway). I will have to look up that yarn as I haven’t heard of it! Let me know if the 86 stitches works out alright. Best to you in Australia! Thanks Jessica. I saw your above comment. Well it was a bit baffling, and I had to have a good think about it and I’m going to add in another rib and cable. Casting on 86 stitches. Hopefully it works out! All have to do is wait patiently for my size 15mm circular needles to come from Perth and the rest of my yarn. Can’t wait! I hope it works out for you too! I think once you get started you will be able to visualize it better. For some reason, it works this way for me most of the time. Best of luck! Same here! 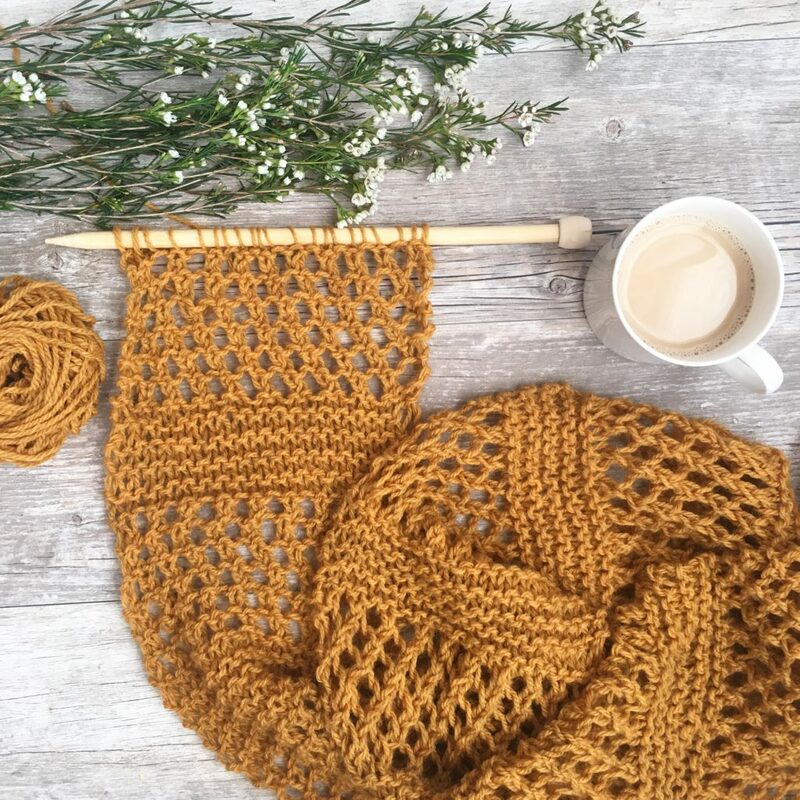 Would love any insight on how to widen the blanket by adding another rib and cable? This is so beautiful and am dying to knit one up as a throw for my living room. Also – the Color Clouds yarn is so soft and cozy! I’m looking forward to working with it. Thanks for this beautiful pattern!! Hi, i would like to increase the length of the throw, so I can lay it across a double size bed (180 cm) + some extra width so it can hang down each side of the bed. Can that be done by just repeating the “endless” mid-section? You could definitely add more ribs, maybe one to each side to add width to the blanket. You could also just continue the pattern for as long as you want the blanket to be. I have made the pattern wider by adding another rib and cable and adding ribs in the middle of the garter stitch on the sides. Before starting I want to be sure that my thinking is right in that the even rows are the right side. hey Jessica! we are closer to making the etsy page, and I want to thank you again for the amazing patterns. you will be one of the first to know when it is made, and feel free to check it out anytime. I will also talk to my friend about a change in email, because we now have a business email that I want to use. you can order handmade items from there, or we can share some of the patterns with you, seeing as you are also a crafty girl and can make your own things. Love this lapghan, making it for my daughter who lives in Florida, so it’s not a tight weave. Used yarn that I bought on eBay, it’s called ice yarns, wool bulky, inexpensive, eight dollars for 8 skeins, shipping seven dollars and ninety two cents. Such a deal. My daughter is tall so making it a little bit longer. I’m using size 19″ circular needles, 40″. Works up fast like you said, I’ve been working on it only two days, looks Great! The cable method you use is great, I learned cables and knitting in 4H about Fifty five years ago. I won blue ribbons for my knitting. Love the endless cable pattern, I just couldn’t stop knitting the cables, they really are nice. Hi Janet! This makes me so happy! I’m honored that someone who learned cables back in 4H is making this. I’m so glad that you are enjoying it. Feel free to send me a picture when you finish. I’d love to see it. Thanks for all the feedback and kind words Janet! Turned out Great! Can’t wait to start another one. Decided to make one a little bit wider. My question is, if I add 26 more stitches, can I just add 13 at beginning and end of each row without adding another cable? Jessica and all you knitters out there, I just did the endless cable pattern try out with my 19″ needles 40″, cast on 86 stitches, I’m no Einstein when it comes to figuring out patterns, especially knitting. What I did was add 13 stitches at beginning of each row, and end of each row. Voila! The width has now become 50″ instead of 34″ with only 60 stitches. I just love this pattern, and I get my yarn on EBay, very inexpensive. Thanks for your help and taking the time to let us know what you did Janet! They say you learn something new every day and I definitely learned something new from your project and so grateful for it. I have been knitting for many, many years and i love the look of cables, but they are a little bit of a pain to do. Till your project, it never occurred to me that you could put the stitches back on the needle instead of knitting off the cable needle. This will be so much easier especially when working with very small needles. Its a gorgeous project and I plan on makig a few of them for Christmas presents!!! Thanks for sharing it with all of us out there in the knitting world!!!!!! I was the same as you when I saw that you could put the stitches back onto the needle rather than working off of a cable needle. I’m so glad it helped you out for future cables too! Thanks for taking the time to let me know! I have been wanting to knit an afghan for my daughter who just moved into a new apartment. LOVE your pattern, instructions and photos! 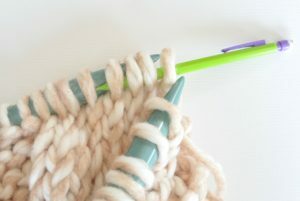 I am new to knitting, and am excited to try your clever cable technique. Question: If I increase the width by 26 stitches (for a total of 86) as you recommended above, and add additional rows for a total of 25 additional inches (from 50″ to 75″), is there any way to determine how many additional skeins of yard I will need? Thank you, so very much for your response! I’m not going to lie – I am NOT good at figuring this stuff out. I bet some readers here that are really into the math part of pattern could do it. I am more into the design of it all! However, for the length only, I would add an extra 5 skeins. For the width – your guess is as good as mine. Ugh! Have you heard of knitting paradise? It’s a forum with AMAZING and experienced knitters. They may know of some trick and math wizardry to figure out exactly the amount of yarn that you need. You can simply post a question there and thy are so helpful! It’s https://www.knittingparadise.com/ Thanks Susie! I hope that your daughter loves the new afghan and congrats to her moving into a new apartment! Thanks for the kind words about the pattern also! I totally get it. We’re talking right brain – left brain! Thanks for the tip to paradise.com. I will post my question there. May I also ask what type of cast on and did you use? And how did you cast off to finish? I hope I’m not burdening you too much with all of these questions! 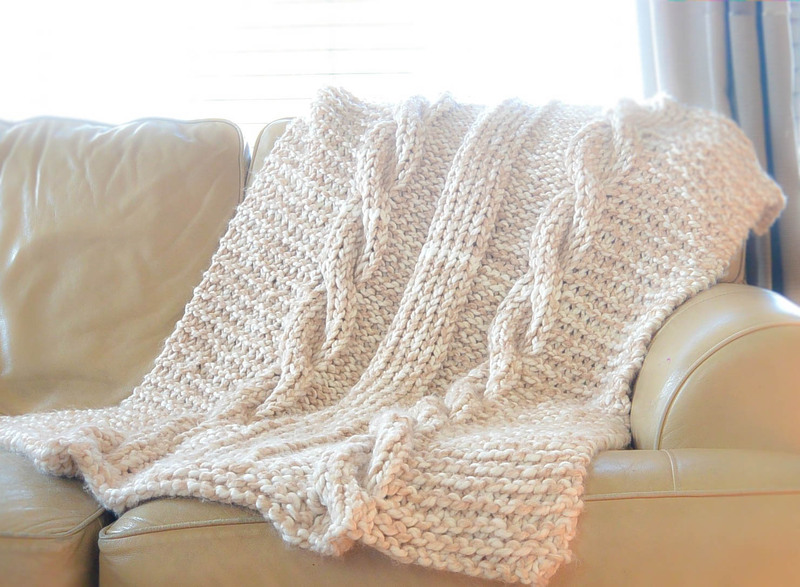 I love this blanket and I have been trying to find an easy cable pattern in crochet. 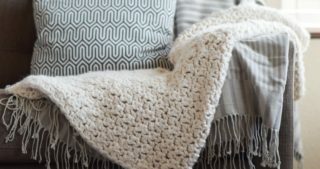 Do you have a blanket pattern in crochet or one maybe coming? 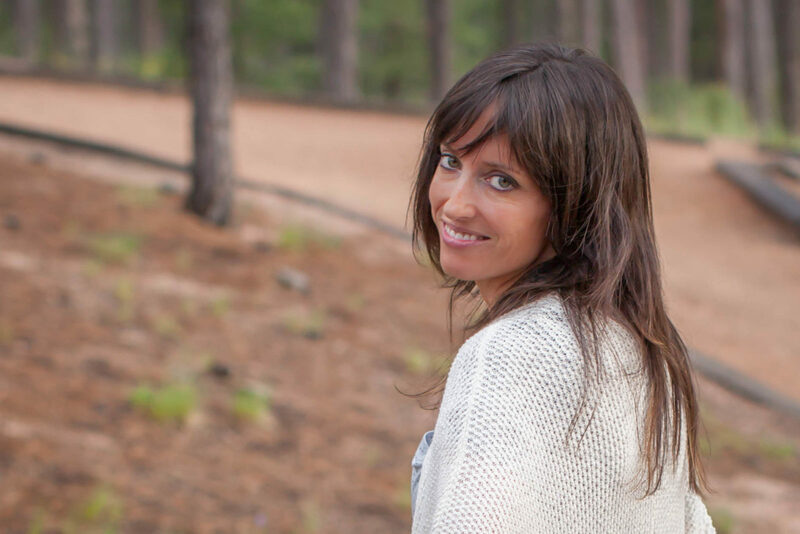 Hi Susanne – I’m so happy that you’ve liked my projects! Thanks so much! You can find a link to a crocheted cable blanket by All About Ami at the bottom of the pattern above. 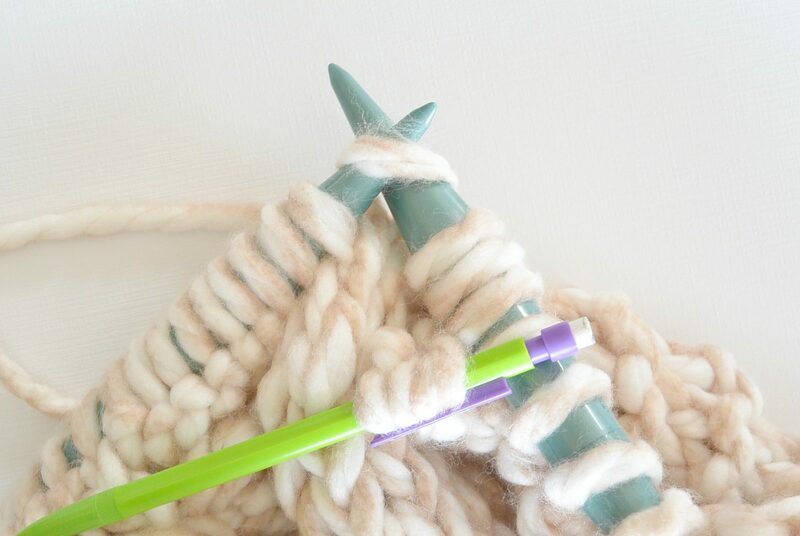 I’ve never tried crocheted cables, but would love to someday! You’re right Carolyne! You end with row 7 on row 15. Sorry for the delay in getting back to you on this! I’ve had hundreds of spam comments to sort through. I have a question regarding rows 11-15. You say to repeat rows 7 and 8 , row 11 being 7,row 12 being 8, row 13 being 7 again, and row 14 being 8 again. What about row 15? Is it a repeat of row 7? Looking forward to knitting this . Hi Armelle! Yes, row 15 will be a repeat of row 7. That is correct! Happy knitting and let me know if you run into any other questions. I have saved this pattern for a long time now, I love it. I’m finally ready to make as a gift and I cant fine the color clouds yarn in travelers tan. Any suggestions for a similar yarn ? 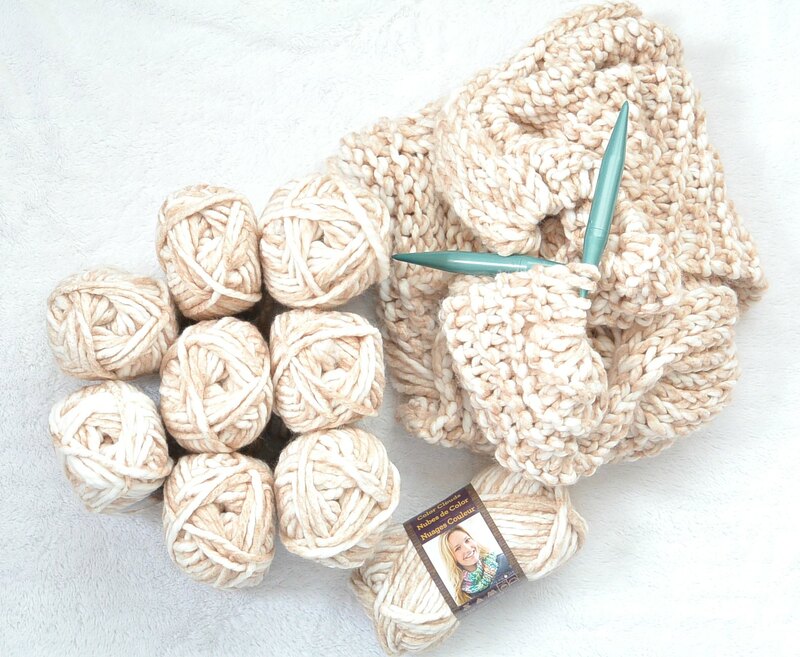 You can really use any super bulky yarn and try holding two strands together. This will make it a bit thicker like the Color Clouds. However, before you buy up a bunch, I’d try it out on a swatch first. Hope this will work out for you! Hi Mary! So glad you like it. For this pattern you’d have to use something close to the 19mm or US 35 needles unless you adjust the pattern a lot. Hi! So I am SUPER new to knitting. I have made a couple attempts several times to start a project, but end up getting discouraged. I love this pattern but have NO idea what I am doing. Do you have a video to go along with your AMAZING pattern? Hi Amber! Sorry – no video this time! 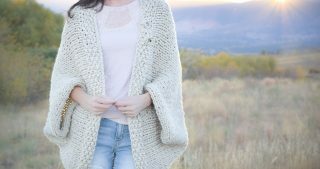 I just googled “cable knit pattern for chunky knitting” and came across this this beautiful pattern, from a fellow Colorado girl!. I’m still experimenting with chunky knitting, but this seems easy enough for beginners but pretty enough to make me not look like a beginner. Thanks for the great tutorial, I love the mechanical pencil! I can’t wait to try it. Hi Mary!! Wonderful to hear from another Colorado girl. So glad you found my blog! I am wondering if I could get away with using straight needles for this project? Thank you for sharing so many great patterns with us! I am going to try the lapghan and hope I can find Color Clouds Yarn somewhere. I loved the pictures of you and your baby and the finished lapghan. Hey there, I am a super beginner knitter (I am almost done with that gorgeous Heirloom knit blanket, it’s amazing!) and I had a question about the pattern. Unless I am missing something, I only see two rows that have LC, Row 6 and Row 16. I don’t see how that would make this a cable? If someone could explain this, I would appreciate the assistance! Just can’t figure it out as I am reading the steps. Thanks! Beautiful! It’ll be my first try on cables. After reading the pattern, I’m sure I’ll manage to knit a nice footghan with cables to warm my cold feet in bed. Daytime, it’ll look beautiful as a throw on the bed. I love the look of those extremely thick super chunky yarns/blankets but this yarn weight seems more manageable than the roving type of wool. Much cheaper, too.